Shaima Qasim Abdul Rahman is 20 years old Miss Iraq 2015 who crowned at a beauty pageant held in Baghdad of Iraq. She is from Kirkuk ( Iraq ) and is pursuing Business Administration right now. 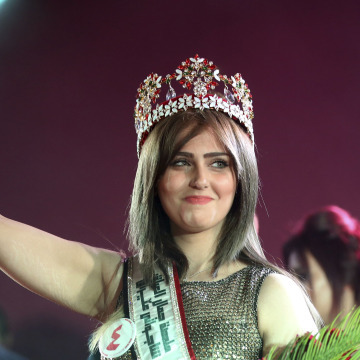 Shaima is the first women to be crowned as Miss Iraq since 1972. She told to NBC news that "I want to prove that the Iraqi woman has her own existence in society, she has her rights like men". She declared the winner among 200 total participants in the event. She crowned at Sheraton Grand Ishtar Hotel in Baghdad. The pageant was directed by Senan Kamel, organiser of Baghdad Fashion Week and co-founded by a group of Iraqi civil activists, Inanna Group, and Al-Mada Foundation for Media Arts & Culture. Members of the jury included representatives from Iraq's Ministry of Culture, Tourism and Antiquities. She is very passionate about beauty, fashion and painting. Shaima was born in the oil-rich city of Kirkuk ( Iraq ) in the year 1994 and is a Business Administration aspirant with two of his cousins as a member of Iraq's federal police who lost their lives while fighting for the country. After getting crowned, the new beauty queen gleefully expressed "I'm very happy to see Iraq going forward. This event was huge and put a smile on the faces of the Iraqis." I'm 20 and from Kirkuk. I'm studying Business Administrations in college. Well, beauty, fashion and painting are my passions. When I heard about the pageant, I talked to my family. They supported me in applying online and going for the interviews. They were supportive from the beginning and continued their supports despite challenges. c ) Did you face threat ? No actual threats were directed to me personally. d ) What gave you a winning edge? I believe all the finalists are queens – we all represented a major goal which is conveying how Iraqis are fighting ugliness with beauty, darkness with light. Winning was the judges’ decision, made according to questions and answers. e ) Speaking of which, was it hard to discuss ideals like world peace in Baghdad? Baghdad’s old name was ‘the city of peace’ – it’s not strange if we discuss world peace and the aspiration to achieve it in the loveliest city of Baghdad. f ) How would this contest give Iraq a sense of normalcy? Well, international media used to show images of violence and war in Iraq – this was a great chance to prove to the world that the situation in Iraq is getting better. Iraqi families are accepting a civil life. g ) What is the status of Iraqi women? Women in Iraq enjoyed a positive history – we had the first female minister in the fifties last century. Many women positively influenced the political, social, scientific and artistic history and life of Iraq. Due to political regimes and wars of the last few decades, women’s role decreased. We hope we can increase positive participation by women at all levels now. i ) What are your plans? My main project is educational support for children in IDP camps in Iraq. I’m trying to promote awareness of this important issue. I’ll hopefully conduct a campaign towards the education of children in these camps. What’s your message for India? India is the country of wisdom. It also has an excellent record in international beauty pageants and winners – one of my dreams is to visit India, meet Aishwarya Rai and ask her for secrets of success. I’ve read about her and love the way she manages her life.